Deadly MERS Virus Circulates Among Arabian Camels : Shots - Health News A new virus in the Middle East has sickened more than 180 people and killed an alarming 43 percent of them. But scientists haven't been sure where the virus originates or how people catch it. Jockeys take their camels home after racing in Egypt's El Arish desert. The annual race draws competitors from around the Middle East, including Saudi Arabia, where camels carry the Middle East Respiratory Syndrome virus. A report in the journal mBIO suggests the virus is ubiquitous among Saudi Arabian dromedary camels, the one-humped variety. The animals get the virus when they're young, and it often doesn't make them sick. "We now know the answers to several questions," says the report's senior author, Ian Lipkin of Columbia University. "First, this virus infection is very common in camels. It probably occurs early in these camels. So this is a reservoir that is constantly replenishing itself. It can go directly from camels to humans, with no need for adaptation in another animal. And there's a lot of virus." "This really confirms that this is a camel virus," says virologist Marion Koopmans of Erasmus University, who wasn't involved in the study. 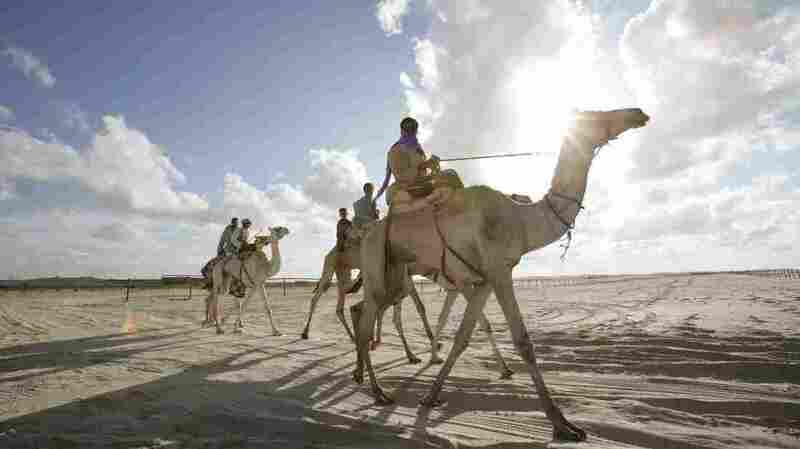 Koopmans and her team had previously found the MERS virus in camels as far afield as Africa and the Canary Islands. But the current study, she says, ends the discussion about whether camels get the virus from people. "It shows this virus is circulating in camels, period," Koopmans tells Shots. At the same time, the new data leave other questions unanswered and even deepen some of the mystery around MERS. The symptoms of MERS — often a life-threatening lung infection — can look similar to regular pnuemonias. So one question is whether people have been getting the virus for decades without anyone noticing or diagnosing it. "What argues against that," Koopmans says, "is genetic sequence data from viruses picked up in people indicating that the virus emerged around mid-2012, not before that. That does not add up to infections having gone on for a long time, but that's still an open question." The biggest puzzle, though, is how people who've had no contact with camels get the MERS virus. "In our cases in Saudi, two-thirds have had no contact with camels," says Saudi Arabia's deputy health minister, Dr. Ziad Memish. It's known that people can get MERS from other humans. But this fails to account for most cases, which occur sporadically, with no obvious source of transmission. One possibility, Lipkin says, is that people pick up the virus from contaminated surfaces, which scientists call fomites. A report published last fall shows that the MERS virus can persist for at least four days in the environment at wide ranges of temperature and humidity. This makes it similar to its far more easily transmitted cousin, the SARS virus, and very different from, say, flu viruses. The virus' ability to persist in the environment may help explain a MERS outbreak last year among hospitals in the Saudi town of Al-Hofuf. But Memish thinks transmission is a bit more complex than can be explained by fomites. "We have strong evidence from a cluster [of MERS infections] in a household with 23 people, only one or two of whom got infected," Memish says. "After 1.5 years and close to 200 cases, we know this virus is not very infectious." The discovery of widespread MERS virus infection in camels does not rule out bats or other animals as intermediaries in the chain of transmission to humans — although the current study didn't find evidence of infection in goats or sheep. It's known that bats harbor a similar virus, and last fall Lipkin's group caused a stir by publishing evidence that a virus extracted from an Egyptian tomb bat contained a short stretch of genes identical to MERS virus from humans. But that bat was one among thousands of samples with no evidence of the virus. And not everybody in the community is persuaded that single bat was infected with the same one that causes human disease. "We need to find out if there is another intermediate host that can carry the virus more closely into the human population," says Lipkin, who has become famous for his ability to track down elusive new viruses. "We need to understand how people get exposed to this virus." The answer, Lipkin thinks, lies in "gumshoe epidemiology" — the painstaking work of investigating what distinguishes people who have gotten MERS from counterparts who haven't. In fact, after a lengthy delay that has generated much criticism, Arabian health officials are about to launch just such a project, called a case-control study. The World Health Organization has scheduled a meeting next week to finalize the study design, Memish says. But Memish doesn't expect the study to answer crucial questions. "I don't think we're going to find anything new because what we've been doing for the last 1.5 years is an in-depth investigation of every case and their contacts," he tells Shots. Koopmans disagrees. A recent WHO report, she notes, "makes really clear that few people [with MERS] have had the kind of follow-up you would want." One sidelight of the new report is the strong suggestion that collaborations between Saudi researchers and outsiders continue to be contentious. A previous collaboration between Lipkin and Memish (the lead person for MERS in the Saudi government) has ended. Although Memish's name has appeared on previous papers with Lipkin, it's missing this time. "We're surprised to see this report coming from their lab, using probably our samples, but we're not aware of it [until now]," Memish says. Lipkin says the group collected its own specimens in Saudi Arabia in collaboration with a group from King Saud University. Lipkin acknowledges his collaboration with Memish has broken down. "We've gone our separate ways, and I wish him well," Lipkin says.